Our residential and commercial buildings are ideal for rats and mice because they can easily get food, water and shelter there. Rats and mice generally prefer to live in the attic, basement, chimney and garden. They can spread diseases and cause significant damage to the electrical wires, roof lines, soffits and gutters. They can even get into your cooling and heating systems, leading to expensive repairs. Before the rats or mice cause immense damage to food stuffs and your property, it is essential that you contact a professional rodent control specialist to prevent the infestation in a timely and efficient manner. 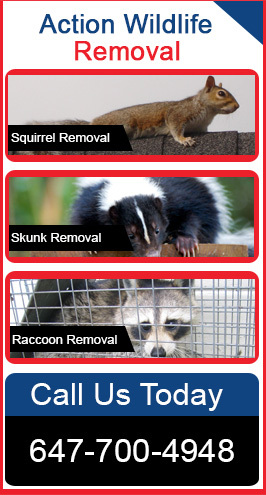 We, at Action Wildlife Removal, provide high quality and effective rats and mice removal solutions across the GTA. Our qualified and skilled team of professionals specializes in different trapping techniques and the exclusion of rodents. Droppings – Generally rodent droppings are shiny and dark and within 2 or 3 days become dull and hard. Mouse droppings can be 3 to 6mm long, whereas, rats droppings can be 12mm long having blunted ends. Rubmarks – These are greasy smear marks which are caused when rat or mouse rub their fur against the walls. Burrows – Rat burrows are most commonly found near the waterways and buildings. Sounds – Rats and mice are normally heard clawing and gnawing at night. They are nocturnal, so are most active at night. Nest – Rodents create their nests with the help of paper, rags and cardboard. Gnawing – Rats gnaw on cables, electrical wires, wood, metal and can lead to short circuits or fires. In short, they will chew on anything that is not harder than their teeth. Inspection – We will inspect your entire place to identify the potential entry points. Bait – We will set up rodent bait stations at various entry points in and around your residential or commercial building. These rodent bait stations securely hold the bait within the location, so that your other pets are safe. Traps – If baits cannot be used, our experts will set up a specially designed traps to catch the rodents. Tracking Powders – Sometimes our professionals also use tracking powders to track and eliminate these little beasts from your property. Sanitation – You can prevent the entry of rat or mice into your property by reducing the food and water sources. Make sure you don’t keep the rubbish indoors overnight. Proofing – Our professionals can advise you on ways you can make your home “Rodent-Proof.” This includes simple measure such as sealing holes and construction gaps to prevent rodent entry. Call us today 647-700-4948. We will help you to Control your Rat and Mice Problem.